Be the first to share your favorite memory, photo or story of Nora. This memorial page is dedicated for family, friends and future generations to celebrate the life of their loved one. 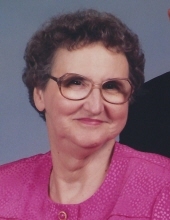 Nora Lee Elrod Taylor, 88, of Fayetteville went to be with the Lord on January 13, 2019. She was born on April 4, 1930 in Nixon Chapel, Alabama to the late Louie Elbert and Sarah Ann Sovolah Johnson Elrod. Nora and her husband, Marvin, met on a blind date in December of 1949 and married eleven days later. She was first a Navy man’s wife and then a devoted preacher’s wife during their 60 years of marriage. Nora and her late husband lovingly served churches in Alabama, Georgia, Florida, Mississippi and Germany. Her ministry lives on in the hearts of her family, her many friends and all those with whom she came in contact. Nora was preceded in death by her husband, Marvin, in April, 2010 and her parents. She is survived by her sons, Kurt (Carol) Taylor and Mark (Cathy) Taylor; grandchildren, Jimmy Taylor, Michelle Taylor, Katie Mendez, Norman Taylor, and Zachary Taylor; great-grandchildren, Saidie Vaughn, Alexandria Taylor, Cody Taylor, Georgia Mendez, Walter Mendez, and Iris Taylor; and great-great-grandchild, Lillie Vaughn. A funeral service will be held at 10:00 AM on Tuesday, January 22, 2019 at the Chapel of Mowell Funeral Home, Fayetteville, with Brother Morris Stephens from Bethany Baptist Church, Albertville, Alabama officiating. Burial will follow the service at Georgia National Cemetery in Canton at 2:00 PM. The family will receive friends from 6:00-8:00 PM on Monday, January 21, 2019 at the funeral home. To send flowers or a remembrance gift to the family of Nora Lee Taylor, please visit our Tribute Store. "Email Address" would like to share the life celebration of Nora Lee Taylor. Click on the "link" to go to share a favorite memory or leave a condolence message for the family.